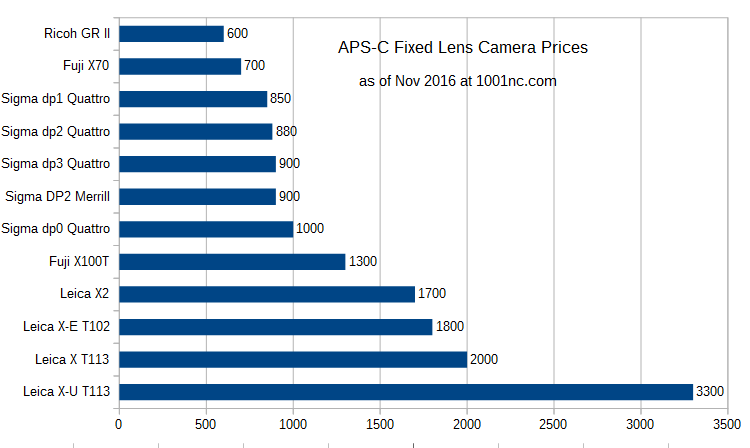 The prices are the consensus prices between Amazon and B&H Photo and Adorama as of November 3 in 2016. These are new condition with USA warranty prices, from authorized dealers. Older cameras that are no longer available in new condition with USA warranty from the above retailers, or are available in a very limited fashion, are not included. We have a pretty steady progression of prices from $450 to $2000, with the majority of the cameras narrowing down to three sensor sizes, 1-inch, APS-C, and 35mm full frame. 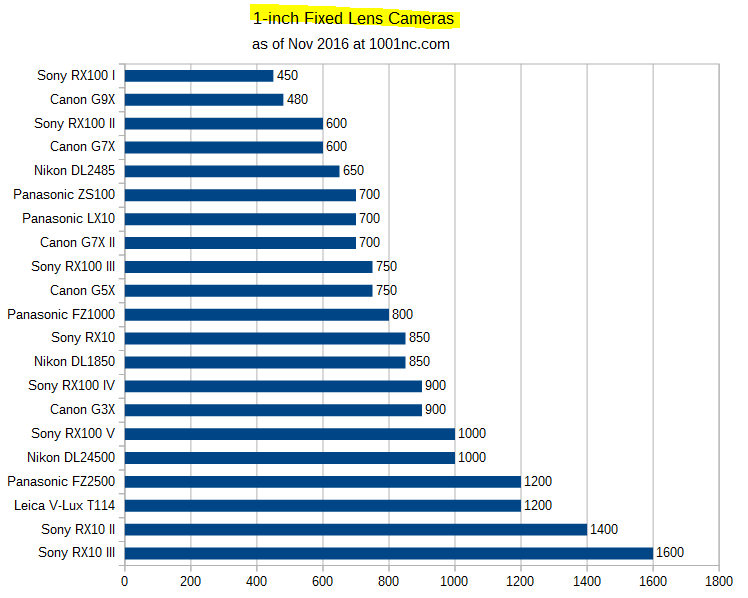 2/3″ used to be more popular, and so was 1/1.7″, while the Canon G1 X* line is the only one carrying the flag for 1.5″. 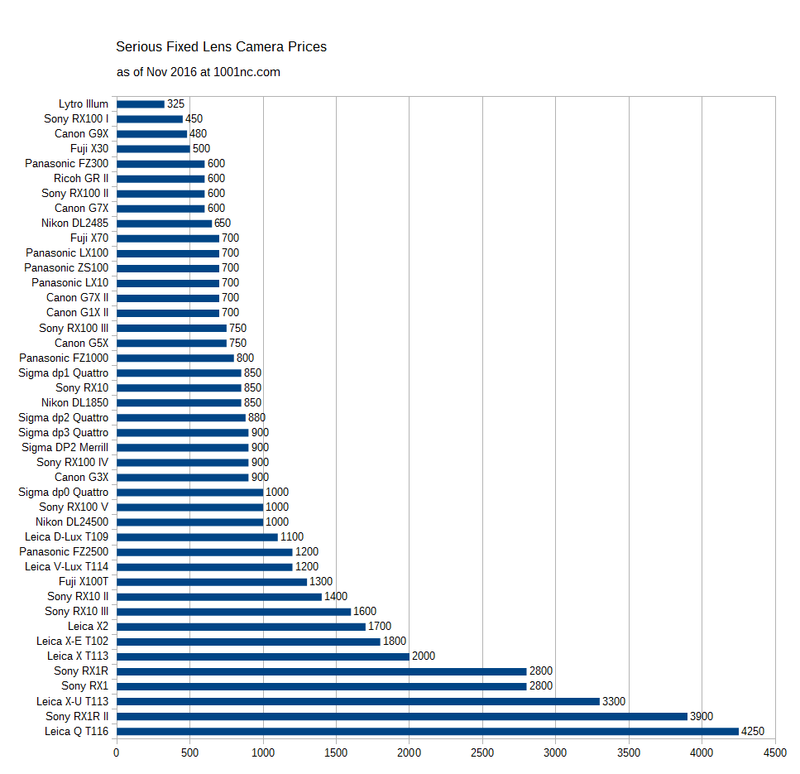 I am no longer adding new 1/2.3″ cameras to the chart but there is one hold-out from the previous chart (FZ300). Canon and Sony are doubling down on this segment by keeping multiple active cameras in their line-up, Canon has six models, and Sony has eleven, keeping all models around of three separate lines, the RX100 (five models), and the RX10 and RX1 (three models each). Panasonic too is continuing with an LX and FZ track. Nikon’s re-entry happened with a trio of new cameras under the DL line (to be released by the end of the year). Fuji cooled off on this segment, but offered a lower-priced APS-C model. Just like the other November 2016 categories, some prices have actually/surprisingly gone up, some went down, many stayed the same. We see the same price pattern here, where the race to the price-bottom is essentially over. The picture below gives you a bird’s eye view. Click twice on it or view the full size PNG for a more readable version (only 50K). Things were fairly quiet in the world of APS-C, with Fuji giving their X100* a lower priced parallel APS-C model with the X70. The only other new camera was a waterproof variation on a Leica theme (X-U Typ 113). Remaining are two famous models among aficionados of this segment, the X100T and Ricoh GR II. One clear pattern that emerged this year is that the 1-inch sensor cameras are dominating the RAWsumer segment. Nine of the eleven new cameras in this segment have 1-inch sensors, including Nikon’s new line of DLs. Sony, Panasonic and Canon all released new models at this size. Their prices are well spaced, with a dense $600 to $1000 section in the middle.